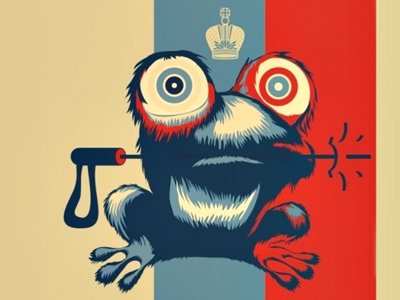 Meet Zoich, a furry frog with hypnotic eyes and a ski pole in its mouth. It will not be the mascot of the Winter Games in Sochi 2014, but has found its rightful place as one of the most memorable memes born in the Russian segment of the internet. The improbable animal was created by Moscow cartoonist, animator and popular blogger Egor Zhgun as a tongue-in-cheek bid for the nation-wide competition of mascots for the Sochi Olympics, launched in September 2010. Zhgun is known for his sharp-witted graphical comments on all sorts of things which make a buzz on the net, from presidential elections to major sport events to the launch of the new season of the series House MD. His works, usually made as mock movie posters resembling those of real-life blockbusters, have won his blog a grateful audience of more than 20,000 subscribers. Zoich was one such sarcastic work. Even its name (more properly spelled Z014) is actually a misread number 2014, written as a mixture of Latin and Cyrillic letters. 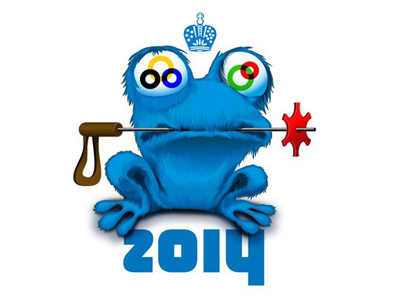 The mascot, resembling the mind-controlling hypnotoad from the cartoon series Futurama, has swirling Olympic rings in its eyes to promote Olympic values and has a crown “to remind about statehood and spirituality” as the author explained in his application form. The blue frog tries to dominate your mind with its swirling eyes. Everybody loves Zoich! 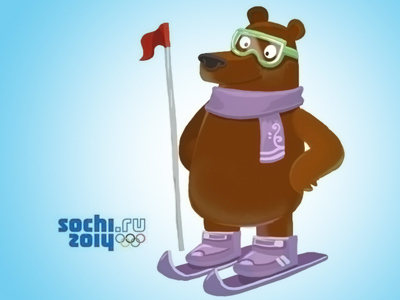 The clever mockery against officialdom of the competition instantly won bloggers love, and Zoich was quick to become the leader of internet voting on the website to choose the Sochi Olympics mascot. A month later, when Zhgun released a viral video to support his bid, Zoich’s popularity skyrocketed. The frog’s rise was widely reported by Russian press, both online and printed, and some TV channels used the recognizable image in their coverage of the mascot competition. However this Saturday, when the Sochi Games mascot is chosen by text message vote among the ten finalists, Zoich will not be among them. Organizers dismissed the frog in favor of less-personalized symbols – bears, snow leopards and snowflakes. Zhgun for his part said it was “understandable and expected”. Zoich supporters were quick to accuse the organizers of censure, lack of respect for public opinion and changing their own rules to suit their needs. The furry frog is a politically-loaded character, and many of its supporters voted for him to make a political statement. “Zoich was born as a joke, but those who see it as simply ‘lulz’ [an internet joke – ed.] are absolutely fools,” Zhgun himself said. Not allowing it into the finals may have been an act of censure. If it was, the question is whether or not it was right to do so. Evgeny Zhgun knew who among Russian politicians is like Batman long before WikiLeaks told the world about it. Most likely, it was, for two reasons. One is that the Russian internet is not the whole of Russia, and users from political opposition, while they are numerous, are not the whole of the Russian internet. An opinion poll done shortly before the finalists were announced showed that more than one third of Russians did not want to have a frog for an Olympic mascot. The second reason is more philosophical. The Olympic Games are supposed to be free of politics. This principle may have been violated on a number of occasions, from politically-motivated boycotts during the Cold War to the massacre of members of the Israeli team in Munich in 1972. Allowing Zoich (or any of its lesser-known and more overtly-political colleagues submitted to the mascot website) would not have been a disaster, but it would certainly somewhat spoil the party for those not interested in political activism.